CAA Fall Art Walk featuring the work of Doug Russell, Ella Watson, and Scotland Steele. Also “Cup Aesthetic,”and Winners from the 4th World Championship Belt Buckle Competition. The MSU College of Arts and Architecture presents the CAA Fall Art Walk on Thursday, October 27th from 6:30 – 9:30 pm. The evening will begin with a lecture by visiting artist, Doug Russell in Cheever 215 from 6:30- 7:30 pm. The Art Walk will follow from 7:30 pm – 9:30 pm in the HEC Gallery and Cheever Hall. The walk will feature drawings depicting architectural ruins by Doug Russell in the HEC Gallery; paintings and conceptual art by Ella Watson in the Cheever Main Gallery, and photographs by Scotland Steele in the Cheever JLF Conference Room. 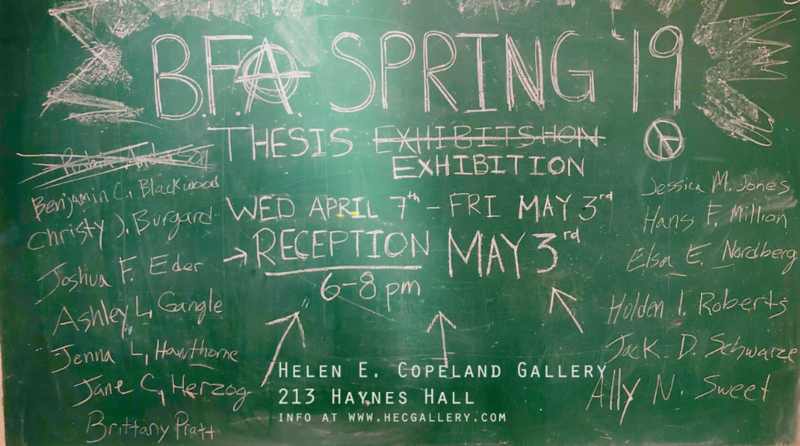 Also “Cup Aesthetic,” a juried cup exhibition by MSU ceramic students in the Dean’s Gallery, and images from from the 4th World Championship Belt Buckle Competition online competition, the brainchild of MSU metalsmith teacher, Bryan Petersen. Hors d’oeuvres and refreshments will be provided, including a cash bar. All events are free and open to the public. On view at the HEC Gallery will be “Upon All of Their Tomorrows…” drawings by Doug Russell depicting architectural remains. Most of the works are made with Prismacolor pencil and gesso on Mylar, giving them a haunting translucency, which only compliments his decaying subject matter. In his work, Russell explores the inevitable effect of time upon human aspirations. Rooted in his love of of direct observational drawing and architectural form, the imagery and process of his work reflect the perpetual cycle of human construction and natural decay in architecture. More of Russell’s work, including his blog and Instagram feed, can be seen at https://hecgallery.com/2016/10/10/upon-all-their-tomorrows-work-by-douglas-russell-at-the-hecgallery/. There is a 50-dollar bill underneath the layers of wax in three of these nine paintings to the right. If you find the money, you get to keep it. DO UNTO THESE PAINTINGS AS YOU DO UNTO THE EARTH. Essentially, to get the money, the viewers had to destroy something beautiful, like in fracking and drilling. Come see the results of this conceptual experiment during the Art Walk, or Monday – Friday, between 9 am – 5 pm till the exhibit ends. For more information on Ella Watson, please visit www.ellawatson.net. Scotland Steele, MSU photography student, will be exhibiting a pop up show of photographs from his travels in the JFL Conference room and the 2nd floor Commons area of Cheever for one night only. Last but not least, “Cup Aesthetic” will be in the Dean’s Gallery in Cheever Hall until November 11th. “Cup Aesthetic” is comprised of ceramic vessels created by MSU Ceramic students and was juried by visiting artist, John Gill. More information about John Gill can be seen at https://craftcouncil.org/magazine/article/masters-john-gill. The HECG is located on the second floor of Haynes Hall, across from the duck pond on 11th Avenue on MSU campus. Cheever Hall is also across from the duck pond, next to Haynes Hall. Please note that the parking passes are required for parking during the business day (9AM – 6PM). For more information about Doug Russell, Ella Watson, or Bryan Petersen contact the School of Art at (406) 994- 4501. For more information on Scotland Steele or “Cup Aesthetic,” please contact JoDee Palin in the CAA Dean’s office at (406) 994- 6654. HECG, Dean’s Gallery, and Cheever Main Gallery Hours: Monday – Friday, 9AM – 5PM / Closed on weekends and school holidays.